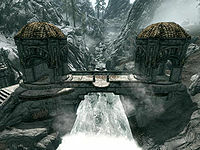 Deep Folk Crossing is an ancient Dwemer bridge over a weir with structures at either end in the northern part of the Reach. A Dwemer convector, used for a College of Winterhold quest, can be found just across the bridge. With the Dawnguard add-on installed, an Aetherium Shard can also be found at the location. You can be given the location of this bridge by the children Sond and Bottar in a random encounter. Approaching the bridge from the south, halfway across on the right is a platform with stone steps up facing due east. Looking from here at the southern bank, you will see a nirnroot directly in front of you. Following the river downstream, you will find an iron ore vein, approximately level where the path turns towards the east and Druadach Redoubt; a few meters further downstream is a second nirnroot. There is nothing of interest upstream except the spring which is the source of the river. Across the bridge on the northward path, you will see a stone plinth. On this stone plinth is an Aetherium ShardDG and a Dwemer Convector along with a leveled helmet and sword. Katria's journalDG reveals that the Dwemer ruin was originally called Bthar-zel, meaning "allied city". A short distance downstream, between the first and second waterfall below the bridge on the southern bank, lies a dead Adventurer wearing the rare Hooded Blue Robes and carrying a copy of The Aetherium Wars.